Well I did say I was becoming obsessed with this style. 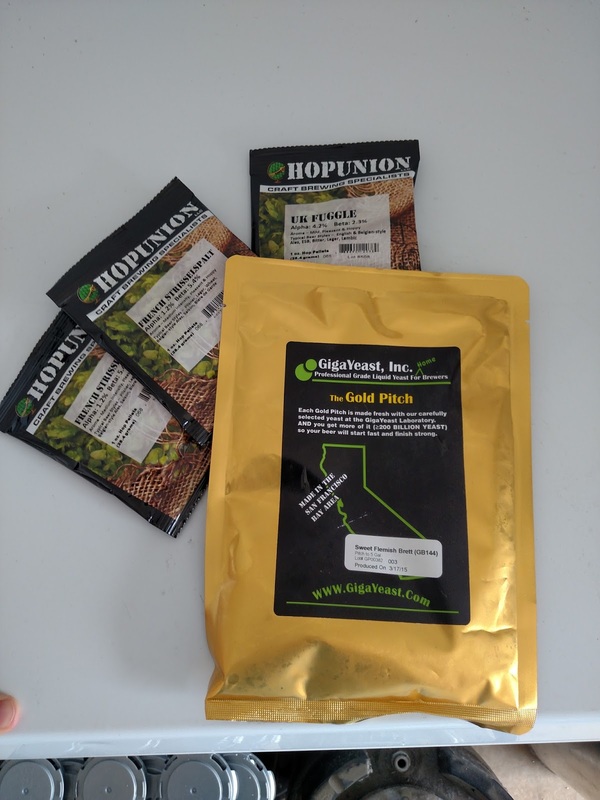 Here's another brew day involving the Bière de Garde style. This time a lighter approach based off of the Lost Abbey Avant Garde clone from the American Sours book by Michael Tonsemire. I want to get a lot of these done and in bottles so I can send some out and also do as much research as I can. There just isn't much information out there on the style and everywhere you read, you see something like "musty" or "cellar like" qualities. Every description says this is hard to do on the homebrew level and I'm beginning to understand why. I have a theory that it isn't the cork or even a cellar that's giving these flavors. I'm thinking it has something to do with wild yeast and brettanomyces that may be present. I'm going to experiment with some different strains to try and replicate this or even develop something I enjoy the most. It may be that these beers need to be corked and forgotten for a while. I'll definitely be brewing more of them to find out! Primary fermentation is going to be carried out by WLP072 French Ale from White Labs again. 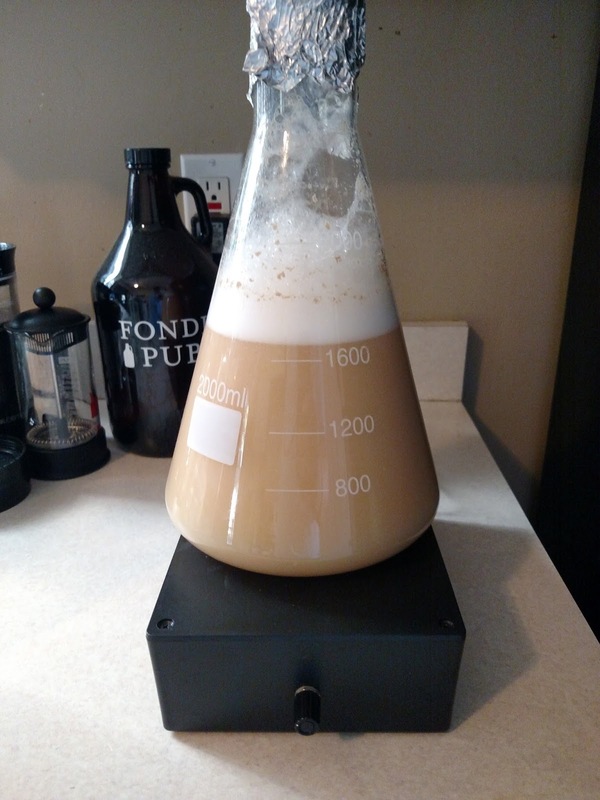 I've really enjoyed how the first BdG I did with this yeast turned out and how it has changed in the keg over time. 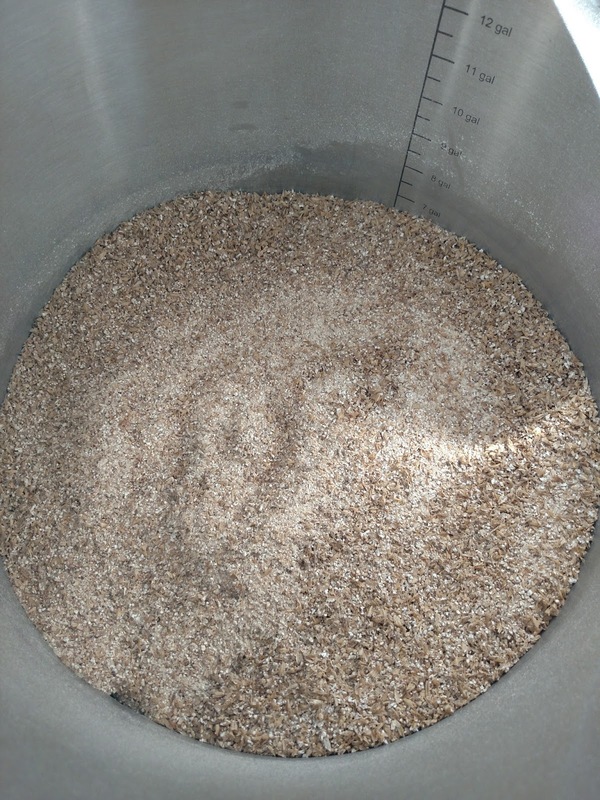 I think it's the perfect clean base for the beer to let the malt shine through. This was my last vial of this yeast so this time I decided to take a few 50mL vials of the starter to keep back and I'll also have about 400mL or so left from the starter to propagate again. If this one turns out as well as the first one, I'm going to want to keep using this yeast. After primary fermentation is complete, I'll move the Big Mouth Bubbler to the lagering phase and let it sit for 4 weeks. After that I plan on adding GigaYeast's Sweet Flemish Brett to the secondary. I really like the description of that yeast from their website and I think a Bière de Garde or something that needs to remain malty will be a perfect base for this brettanomyces strain to add it's subtle nuances. I'm going to do a good starter before hand since the packet is right at 8 months old now. Plus then I can pull some of it out and keep for future use. Hops and GigaYeast Sweet Flemish Brett. The hops are Strisslespalt and Fuggle hops. I don't want a good bit of hop presence but I do want the preservative factor and the bitterness to be present. I kept it simple here going with the classic Strisslespalt for bittering and the one ounce of Fuggle at 25 minutes. I've been a little low with my efficiency lately so I decided to adjust my grain mill again. I tightened it up just a bit and sent the grain through it. (Spoiler: I hit my numbers on the nose this time!) 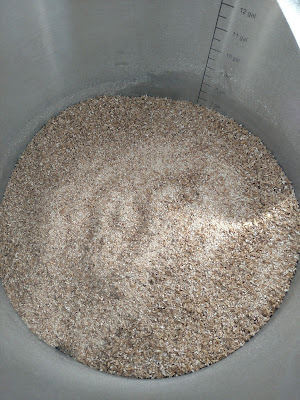 My last brew day (Dark Saison here) I decided to underlet the mash like I've seen on Tony Yates' YouTube videos. Check his channel out for a TON of great information. It really does make for a better mix of the grains and water for me. My mash has had no dough balls and I just give it a quick stir before starting the re-circulation. I did notice this time though that I had to use some water from the HLT to blow through the valve and get rid of a small clog in the beginning. Maybe next time I'll put a small amount of water in under the false bottom before adding in the grains. I did do a little better with the pH of my mash this time. I checked it before adding anything and it was at 5.5. I then added food grade lactic acid to bring it down to 5.26 and called that good. Love the sight of a tasty grain bed! The mash went smoothly and the wort really cleared up nice during the re-circulation. I was able to keep the temperature at 152-154F during the entire hour and I mashed out at 167-168F for 15 minutes before starting my sparge. I collected 10.5 gallons or so after about 45 minutes and then started my boil. The boil is something key to a good Bière de Garde I believe. You need a good long boil to caramelize some of the sugars and keep those sweet flavors after fermentation is complete. Two hours is what I did for the last one and what I did for this one. I think that's probably the minimum. The first attempt, I was able to keep the malty flavors even though the beer dried out around 1.004. Easy to drink and dry with the sweet malty flavors needed for the style. After the boil I whirlpooled for 15 minutes to bring any hop particles that had gotten out of the hop spider and then I sent the wort through the plate chiller and into my carboy. One pass I was able to get the wort from 200F to 68F by using a prechiller in ice for the water side. I'm loving this plate chiller! Took one of the longest parts of my brew day down to the shortest. Took a sample to confirm my refractometer findings with a hydrometer and we were sitting right on the nose at 1.060 for a starting gravity. I pitched about 1200ml of the WLP072 starter and set the carboy in the fermenter with the temperature set on 64F. I'll bump it up in the next few days a bit but I really want this to ferment clean. I'm using the Big Mouth Bubbler again for primary since I'll be lagering this one then transferring to secondary. I love the spigot feature on the bottom. Still not happy with the seal on the top but I'll make sure to keep tightening it as I pass by each day. 11-9-15: 5:30AM full krausen had formed and she was bubbling away! 11-20-15: Lowered temps for cold storage period. 12-30-15: Raised temps back to 65F and added in the Brett from GigaYeast. 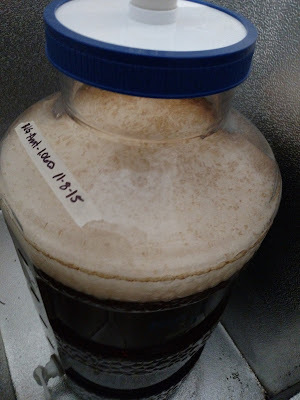 1-6-16: Visible activity from the brettanomyces. Set temperature to 68F. 2-19-16: Gravity stable at 1.004. 2-25-16: Bottled. Tasting notes here.